Let's be clear, Spielberg is such a skilled director that he makes what is essentially a bunch of people standing around talking and sorting through documents into riveting drama. Even if it takes a bit of time to really get going. Spielberg is usually at his best when he's telling fantastical stories and takes us away on wild adventures. But he knows the human experience inside and out and sometimes settles for telling simple, human stories, adventures be damned. I'd still rank “The Post” among his more middle of the road serious dramas. It's still no match for classics like “Schindler's List” or “Munich” but it works much better than another historical drama that also functioned as a reflection of our current times, “Lincoln.” This time you can't take your eyes off Streep instead of Daniel Day-Lewis. Shockingly “The Post” marks the first onscreen appearance of both Tom Hanks and Meryl Streep together. Two of the most popular current actors of today and they've never shared the screen. It makes for some great power dynamics. Streep is Kay Graham who recently took over The Washington Post after her husband's death. Hanks is Ben Bradlee the editor-in-chief of the Post. 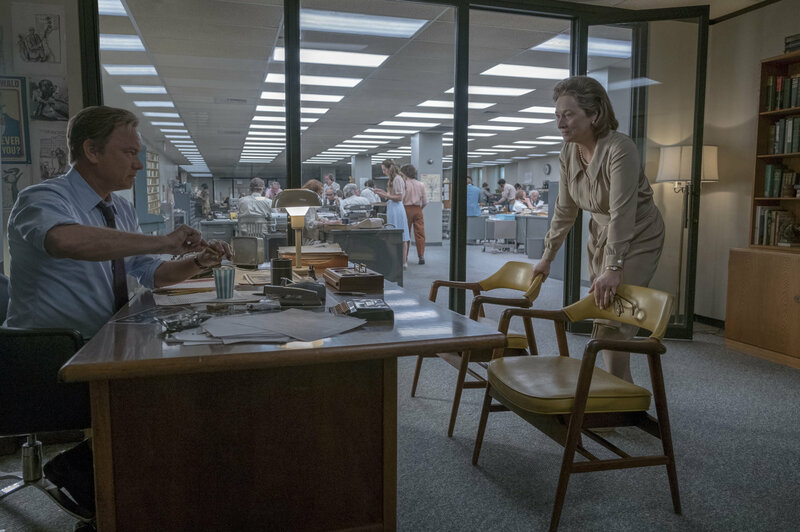 What soon conspires is a game of wits between the two as she struggles to keep the paper relevant and afloat (while dealing with the company's IPO) while Bradlee struggles to compete with other papers who seem to be getting all the good stories. Soon they must work together and decide the moral and ethical dilemma of publishing classified documents pertaining to the government's years and years of mishandling of the Vietnam War. Liz Hannah and Josh Singer's screenplay make a ploy for social injustice and issues though it doesn't tackle the themes as overtly as some films do. Streep, as a woman stuck in a world surrounded by men (much like Clarice Starling in “The Silence of the Lambs”) must overcome the hurdles of a still patriarchal society as women's lib was in its infantile stages at the time. It's no secret that the Pentagon Papers as they became known, did end up being published, but because of Spielberg's master craftsmanship he wrings plenty of suspense out of what is essentially a very talky picture. The film takes its time telling its story which is fine, though there's really nothing to flashy about the way its told. 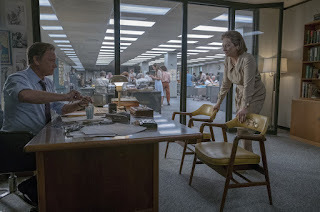 This is sort of old fashioned movie-making that harkens back to the gritty human dramas of the 1970s not unlike “All the President's Men.” Seeing Spielberg return to the 1970s setting is a treat as it's a time period we rarely get to see the seasoned filmmaker work in. All of his usual team members adapt nicely to the time frame with John Williams simple but nice score and Janusz Kaminski's expert camerawork. He also wrings fantastic performances from his ensemble cast who make their work seem too easy. Streep does particularly good work here but when doesn't she?